HONOLULU (AP) — Sirens wailed while workers piled sandbags in front of hotels and police blared warnings to tourists to leave the world-famous Waikiki Beach as Hurricane Lane barreled north after dumping nearly 2 feet of rain on Hawaii's mostly rural Big Island. Suzanne Demerais said a tiny waterfall and small stream flowed near the home when she first arrived with four of her friends from the Los Angeles area. But the stream turned into a torrent and the river rose rapidly over 24 hours. Hawaii County firefighters, who were in touch with the home's owner, decided to evacuate the group before the water rose further. They floated the five out on their backs, Demerais said. 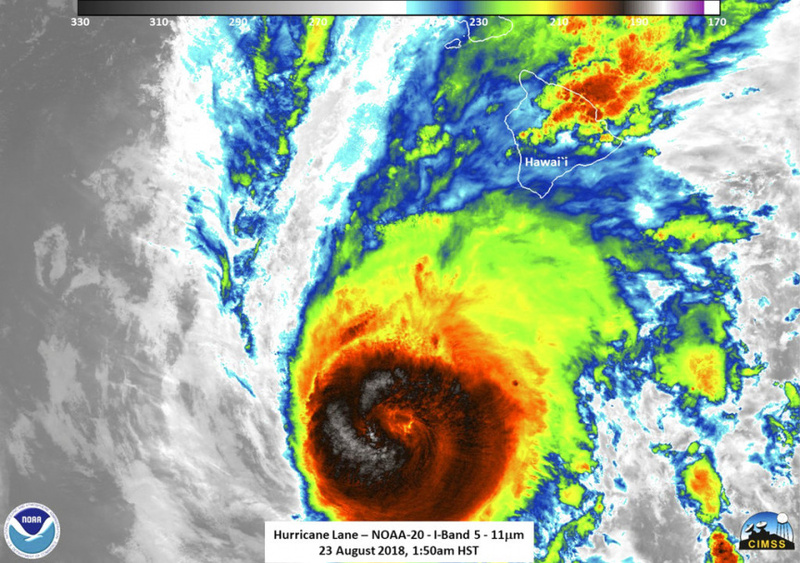 Hurricane Lane, which was still offshore, lashed the Big Island with nearly 20 inches (50 centimeters) of rain in about 24 hours. It was packing maximum sustained winds of 120 mph (193 kph), making it a Category 3 hurricane. Forecasters say it will move close to or over portions of Hawaii's main islands later Thursday or Friday, bringing dangerous surf of 20 feet (6 meters). "We knew it was coming, so I tried to just cram as much as I could into the last few days in anticipation so we could cross things off of our list," said Brinson, who is accustomed to hurricanes after living in Florida. Shelters were open throughout the islands, with 350 people in them in Oahu. Aid agencies were also working to help Hawaii's sizable homeless population, many of whom live near beaches and streams that could flood.